I was approached a while back by Gecko Software and asked to test any of their products. It has taken a while to get this organised but for the last month I have been watching the results of a data mining test I did using the software and now is the time to publish the results. Whilst the software is not really designed to produce a trading system per se, I felt that given the type of readers GreatTradingSystems.com gets it was vital that part of this review included something about the actual data it generates. The TradeMiner software is now available for Stocks, Futures, and Forex, and I decided to review the Forex version but I no reason to believe any particular version would be more or less useful than the others. I chose forex as that is what most of our readership trade. Data mining is somewhat of a passion of mine but usually I have to do it by hand or at the very best a crudely created Excel spreadsheet. Whilst data mining is no holy grail it can provide a useful insight into how the market moves over a whole basket of trades. To many traders focus on winning each trade when they should be focusing on winning a decent % over, say, 100 trades. What TradeMiner Forex 2.0 does is allows you search historical data using various selection criteria and which then pulls out possible similar trades based on that criteria. What you read into the results is up to you. The software itself is ridiculously simple to use. In short, you can select whether to search for trades by month or by forex pair. You then select the % of wins the trades must fall within to be counted. You then select whether to crawl, buy or sell trades or both. But the best part, in my opinion, is it allows you set the length of trade. This allows you really customise your search to how you trade. If you like to hold trades for up to 3 days you can select 3 days, if you don’t like to hold longer than 1 you can fix it to that. It really makes the data mining a personal experiment . Once you have selected your criteria, the actual ‘digging’ only takes about 10 seconds for search for a specific month. Then it is up to you to filter the results. However, TradeMiner provides so much information from max profit, average drawdown, stop %, total wins, biggest win, annualized profits, biggest range of move and more. There is pretty much every calculation you could want. There is even a colour coded ‘score’ to help you scan the results quickly. Naturally you can rank the results by any of these analytics, again making this process really personalized. So after filtering and ranking the data you now have a list of trades with the trade direction, the forex pair and the date when to trade those trades. It is that simple. This can be exported to your portfolio so you add and mix different data test to create a detailed trading portfolio. You can view the past performance of your selected trades in graphical form and you can also print your trades. As far as the software goes I don’t see how anyone can fault it. It is simple to use, works quickly, provides you with an endless amount of information to filter your trades by and will save you hours of collecting the data and manually filtering it in a spreadsheet. If you like to mine data then this really is a great tool. Before the start of May I used TradeMiner to produce some trades for the the month of May. The selection criteria was simple; trades with 1 day in length, 85% strike rate and using at least 5 years worth of data. You can read the full article here. In my experience when using data to trade one should expect a strike rate between 40-60%. Combine that with a good risk to reward ratio you will have a profitable system. And more importantly a consistent one which is more trade-able than the so called best systems out there. Having now review the May trades the results were pretty much as expected. Out of 21 trades selected for the May forward testing, there were 14 winners and 7 losers. This gave a strike rate of 66%. It was also interesting to learn that the suggested “stops” were in line with the win/loss ratio meaning that traders were not stopped out before reversing and ending in a paper profit. By my analysis all traders that were stopped out were losers when looking at open and close data alone. This adds weight in my opinion to the data, although it should be noted that some of the stops were very large and I would not advise using such sized stops. But for the purpose of establishing the usefulness of the data I think it spoke volumes. 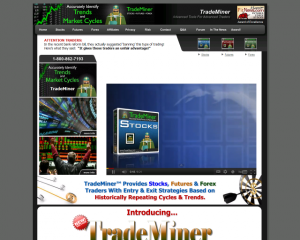 So, Trade Miner forex mines data effectively and that data CAN be useful to the independent day trader. What you do with that data is up to you. TradeMiner themselves suggest that you do not use data alone to make trade selections which is good advice but there are multiple ways that one can use data to enhance your trading profits. But for the purpose of reviewing the software I can not find fault with it and although I do no know of its competition in its niche I think if you want a simple way to crawl a lot of data very quickly to use as part of a well thought out trading system I don’t think you can go wrong with TradeMiner Forex 2.0. Should you have any questions about this software and its uses please feel free to ask. It is very hard to include all the information you may want in a short readable article. Disclaimer: I was not paid for this review and at the time of this review being published I do not sell TradeMiner Forex and will indicate should this change in future. As I have not reviewed other similar software I can not make any comparison to such software as to which is best. A software for trading must be easy to use and reliable. And it is from what I found. Interesting review. Can you share your final notes on this though? I’m curious to know if you really recommend this software compared to the many others on the web. I’ve used the other software but I haven’t used this one. Let me know. Yes, if you want to trade via mined data then I can’t see why you wouldn’t use TradeMiner. But not everyone wants to trade via historical data probabilities. Each to their own I guess.